Carrying a shield like this Roman Arena Wooden Shield, the Roman soldiers utilized superior tactics to decimate their enemies, oftentimes forming a near-impenetrable shield-wall, just like the ferocious Spartans that came before them. 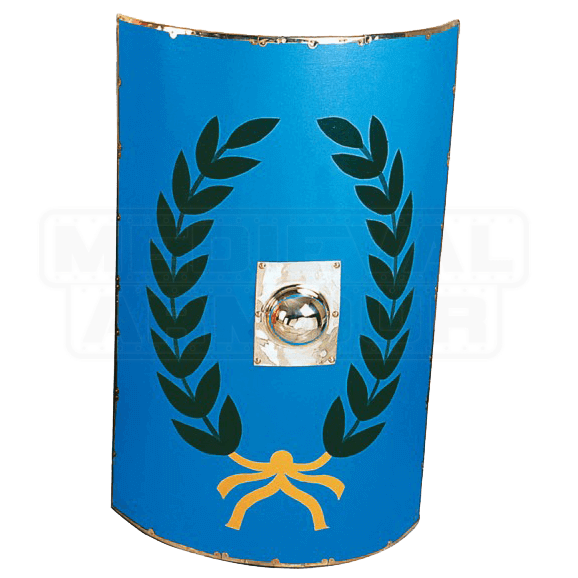 This shield, also called a scutum in Roman terminology, is not your typical Greek shield, which were traditionally circular in shape. 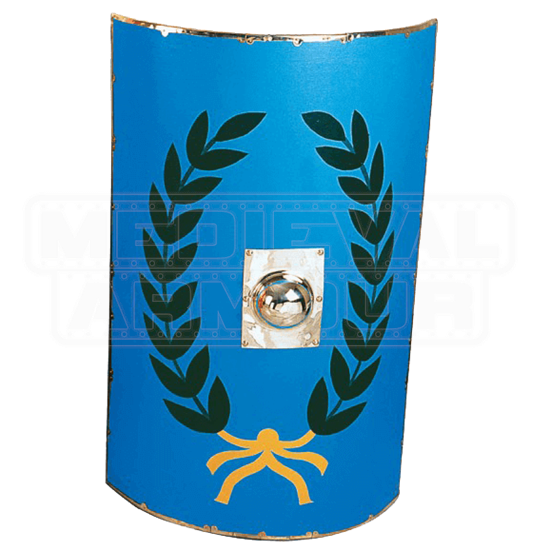 This shield is square-shaped, in order to defend as much of the upper and lower body as possible. It features a concaved shape that curves subtly around the holder and allowed nothing to get past when interlocked with others, while also featuring a brass metal boss at its center, which helped to shrug off blows from attackers. The shield features a blue face, with green laurels wrapping around the central boss, while a yellow ribbon secures the laurels at the bottom of the shield. This shield measures approximately 35 inches tall and approximately 20 inches wide. Not all Roman shields were red and gold. This Roman Arena Wooden Shield is a perfect example of a shield that might have been carried by a legionary or by a guard in the city, and it is also a truly impressive historically replica that would look great mounted on a wall and admired by collectors, enthusiasts, and onlookers of all ages.